Published: Dec. 30, 2018 at 06:57 p.m. 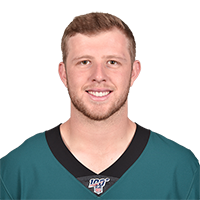 Published: Aug. 16, 2018 at 10:26 p.m.
Philadelphia Eagles quarterback Nate Sudfeld throws an over-the-shoulder touchdown pass to wide receiver Rashard Davis. Published: Aug. 16, 2018 at 10:13 p.m.
Philadelphia Eagles quarterback Nate Sudfeld tosses a 17-yard pass to tight end Richard Rodgers for a touchdown.